The Art of Shaving After-Shave Balm soothes, refreshes and regenerates the skin after shaving. The Balm is an antiseptic and is oil and alcohol-free. 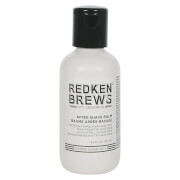 The After-Shave Balm is recommended for normal, sensitive or dry skin, and for applying during dry winter months. Formulated with grape seed, shea extracts and Vitamin C, it moisturizes, rejuvenates and revitalizes to promote healthy skin. Apply a nickel-size amount of The Art of Shaving After-Shave Balm or Gel to face and neck after shaving. Avoid cologne aftershaves since these contain 90% alcohol, which can irritate and dry out skin. Moisturize skin often as moisturized skin is less prone to ingrown hairs. To heal ingrown hairs, exfoliate area with Shaving Brush and keep skin moisturized by moisturizing before bedtime as well as after shaving. Avoid products with numbing agents such as Benzocaine or Menthol as these will tighten pores and stiffen beard. I was given a starter set of "The Art of Shaving" which included the oil to be applied before shaving, shaving cream, brush to apply shaving cream and balm for after shave. This has changed my whole thought process about shaving. I used to see shaving as a mundane necessary step to complete each morning, now I look forward to it. Not only this. The starter kit makes an excellent gift for birthdays, father's day and Christmas and you don't have to spend a fortune ($25.00). I'm hooked. I have really sensitive skin, and have always had a problem with razor burn and irritation after shaving. This balm is absolutely wonderful. I use the pre-shave oil, then the cream with a brush to shave, and then finish off with this balm. No more burning or irritation!It is a tad spendy, but a little goes a long way, so it lasts a really long time. And it smells great--my wife loves it and likes to nuzzle my face and neck after I put it on.